No matter how many people come into your office, keeping it clean is extremely important. Whether you have customers coming and going, or it’s just you and your employees, your office deserves to be clean. It may not seem like a worthy expenditure of time and resources, but there are huge advantages! Why clean? From the floors to the walls, from the carpet to the furniture, your office can get pretty gross over time – and we’re not just talking about dirt. Grime like dander, dust, allergens, and bacteria accumulate virtually everywhere over time. No matter the size of your office, it needs to be cleaned. Staying on top of things, either by yourself or through a cleaning company, is important but it’s not always enough. Occasionally an even deeper cleaning is necessary. -Dry of Acadiana (shameless plug) can clean the things you don’t have the time to and keep your office free of allergens and dust. In fact, our cleaning formula removes 98% of common allergens from carpet and upholstery and removes 89% of all airborne bacteria. This improved air quality will lead to overall health benefits for you and your team. Promotes professionalism. If you do have an office that customers will see, it is essential that your office is clean and professional. Your office is a direct reflection of the quality and professionalism that your company has to offer. Think about your favorite places to frequent as a customer, or businesses that have left a positive impression on you. Professionalism and cleanliness are important traits for a business to display. Many customers will subconsciously make business decisions based off the appearance of your business, and studies have even shown that something as simple as the quality of your carpet or flooring will factor in. Earn the trust of more customers by maintaining a clean work environment! Psychological benefits. 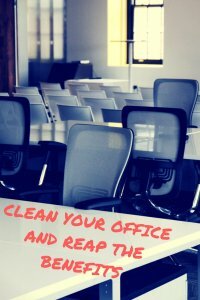 A clean office also impacts the employees that work there. As Americans. we spend an average of 33% of our lifetimes working. Think of how many years that is in an office! (Or don’t, we don’t want to bum you out). But… If the office is clean, people will enjoy being there more, they will be less stressed, and they will have a greater desire to work hard. Harder work equals success as a business (but you don’t need us to tell you that, of course). It’s science. Boosts productivity. You may think that everyone is too busy to stop working and clean. But if the psychological benefits really do boost productivity in the long run, then isn’t worth it? PLUS you always have the option of leaving the cleaning to Chem-Dry of Acadiana (another shameless plug, we know). Not only will your productivity keep rolling without a hitch, but you’ll get a much deeper clean. Commercial Carpet Cleaning Services from Chem-Dry of Acadiana in Lafayette. Commercial carpet cleaning is one of our specialties! We want our customers to be happy and satisfied, so we’ve spent years practicing and perfecting our cleaning methods. Plus, our cleaning methods are fast, and the carpets dry in a few short hours, allowing you to get right back to work. We’re your answer to the office cleanliness dilemma!